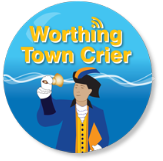 Bob Smytherman is the official Town Crier for Worthing, West Sussex a role re-introduced by the Worthing Town Centre Initiative in 2014 helping to promote the Town and its events and activities. The last Town Crier Philip Holliday hung up his bell in the mid 1990’s after being appointed to civic office in 1980. 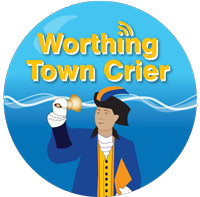 For nearly 20 years Worthing has not had a Town Crier and the Worthing Town Centre Initiative, a business led organisation, felt this was a missed opportunity. 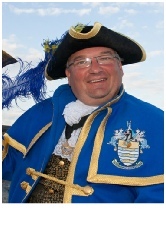 The Town Crier role is not a paid position and Bob volunteers his services to the Worthing Town Centre Initiative who provide the administration and cover the costs of the role, which includes the upkeep of the regalia and bell. Originally a town crier, or bellman, was an officer of the court who made public pronouncements as required by the court. The role developed to include making public announcements in the streets with the Criers dressing in elaborately decorated robes, white breeches, black boots and a tricorn hat. Town Criers carry a handbell to attract people's attention, as they shout the words "Oyez, Oyez, Oyez!" before making their announcements. 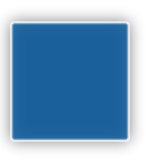 The word "Oyez" means "hear ye," which is a call for silence and attention. Oyez derives from the Anglo-Norman word for listen. 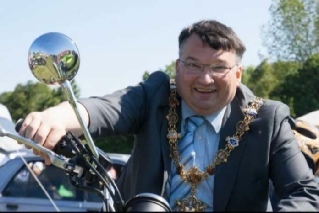 In 2010 there were 144 towns in England and Wales with town criers registered with the Ancient and Honorable Guild of Town Criers and today they mainly perform ceremonial duties for their Town.